Visual Paradigm enables you to integrate the visual modeling environment with NetBeans, providing full software development life cycle support. 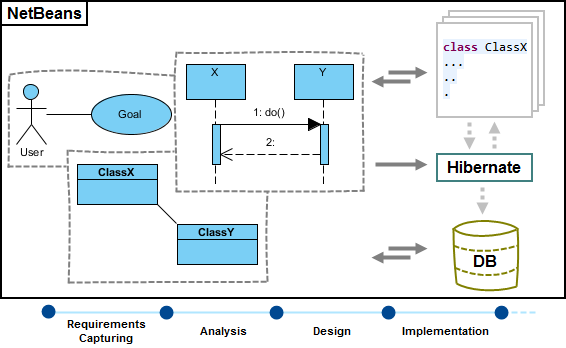 By designing your software system in Visual Paradigm, you can generate programming source code from class diagram to an NetBeans project. Also, you can reverse engineer your source code into class models in Visual Paradigm. Select NetBeans Integration. You can run Visual Paradigm in multiple IDEs. In other words, if you need you can select multiple IDEs here. Click Next. Specify the folder path of NetBeans. Click Next to start copying files to your IDE. NOTE: NetBeans integration can only be installed on one NetBeans directory only.. 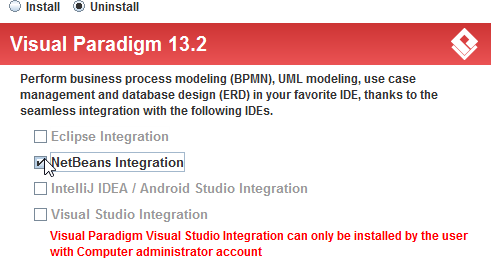 NOTE: If you cannot find any Visual Paradigm menus in NetBeans after the installation, it could be due to our plug-in failed to be recognized by NetBeans. To solve this problem, please deactivate any plug-in in NetBeans and restart NetBeans. You can manage plug-in in NetBeans by selecting Tools > Plugin in NetBeans.